We're in that weird period between summer and autumn, when we don't quite know if it's sensible to keep stocking up on dresses or a new season coat. It's still so sticky and humid I cannot possibly fathom stretching a woolly jumper over my head just yet. Not sure about you? So naturally, I'm all about the transitional pieces, that are going to look lovely both with bare legs and sandals - and also a jacket and tights once the weather takes a turn. 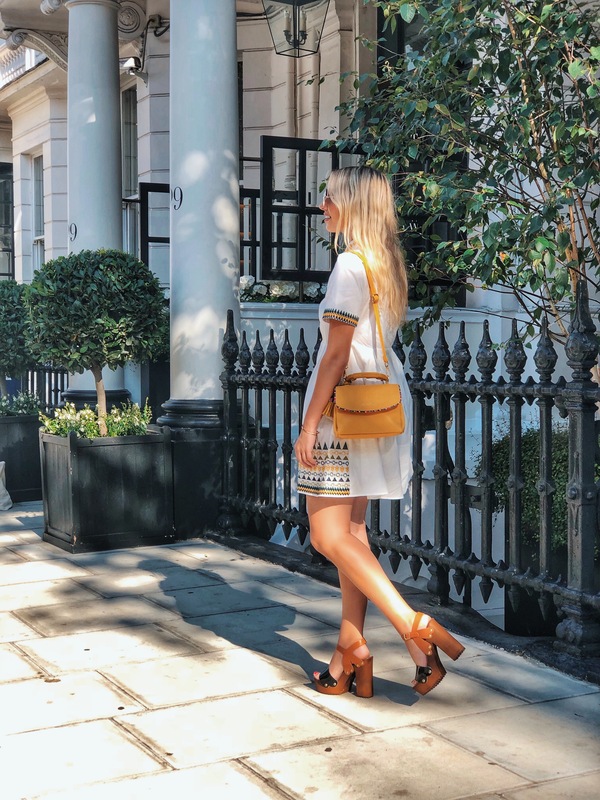 YOOX have some gorgeous pieces that fit my above requirements perfectly - and so I picked out a pretty new dress, pair of sandals and handbag to see me through until September. My friend Heather and I haven't seen one another in months, so we had a full powerpoint presentation of updates for one another to catch up on. A perfect outing for my new outfit. I've been a bit safe with my style over the past couple of months. I know that pretty pink and floral dresses are my comfort zone - despite the fact I'm no longer a five year old with a block fringe and a blonde bob. Now that I'm almost 25, I thought I might experiment with something a touch more sophisticated. I'm forever passing by gorgeously elegant classy women sashaying down the street in shirt dresses and sandals. And while I've always made a mental note to try out this particular style, for whatever reason, I never have. This stunning embroidered Jovanna Guipure shirt dress on YOOX for £98 (down from £161) caught my eye, with a subtle but classic looking pattern. In person, it certainly doesn't disappoint - and despite the humidity (and battling the tube at rush hour), the cotton fabric kept me cool and comfortable. I had no less than two compliments about the dress during my afternoon tea date, which was unexpected, but flattering. You always know you're onto a winner when typically fairly unfriendly Londonders stop you in the street to ask where your dress is from or offer up kind words. 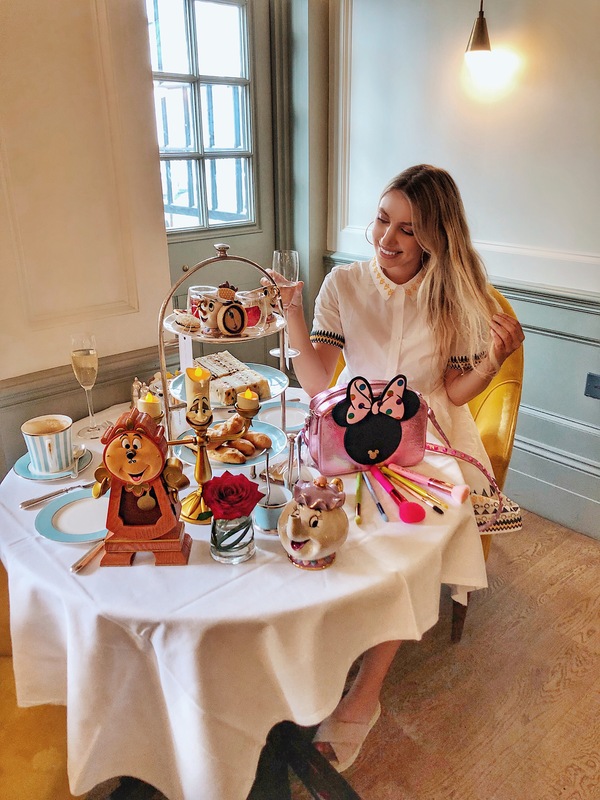 Although smart enough for an afternoon tea date at The Kensington, the dress ticks that normally fairly difficult 'smart casual' dress-code, making it ideal for an assortment of occasions. I've worn it twice since, once to a BBQ and another for a dinner date. And it's now my new favourite item! I'll be totally honest here when it comes to the reason behind picking us this pair of Primadonna sandals. I'd just got back from seeing Mamma Mia at the cinema when making the order and they reminded me of the Dancing Queen dance number. Surely that's a very acceptable reason to get a pair of new shoes. Right? I wasn't sure if I could pull them off myself, but that didn't matter - I was practically Lily James' character Donna, and that's ALL that counts. In person, luckily they didn't disappoint and they're actually far comfier to walk in than I originally anticipated. The heel and platform give your legs a lovely boost, and the studded detailing adds a little edginess to an otherwise quite feminine, classic outfit. I love the two-tone effect, which makes the shoes very versatile in pairing them with an assortment of outfit combinations and best of all, is the price - £20! 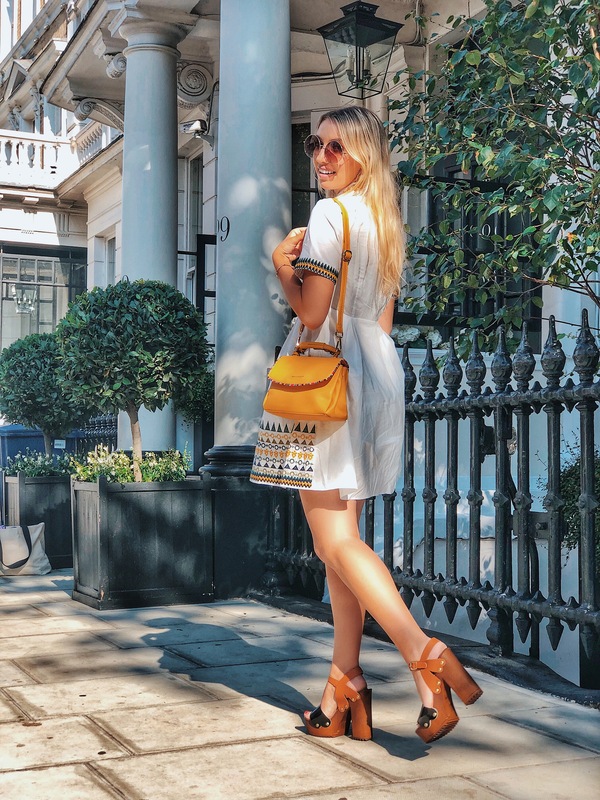 I wanted to inject a little bit of colour into my outfit, as the sandals and dress were largely quite neutral, so I took the yellow accents from the dress and picked out a gorgeous faux leather bag from YOOX by Naj-Oleari. I love the tassel detailing - and also the size of the bag, which is ideal for a day out! At only £25 too, it's certainly very bank account friendly. What do you think of my new outfit? Are you stocking up on any transitional pieces?